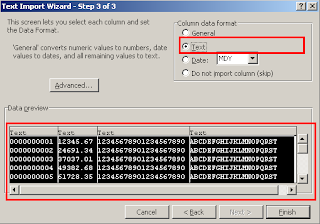 When we download the data from the SAP using FMs like GUI_DOWNLOAD or WA_DOWNLOAD (absolute); or the method of class CL_GUI_FRONTEND_SERVICES=>GUI_DOWNLOAD and open that file in the Microsoft Excel, we loose some important information like leading zero, long numbers will come as exponents. Most of the times we don’t want this because we will use this File as input of some program or we will use it for future analsys. 1. We will save our file with .txt extension instead of the .xls extension. 2. Start Excel. Start > Run > Enter Excel. 3. Open the downloaded file by Selecting it from the Open File dialog box. 4. 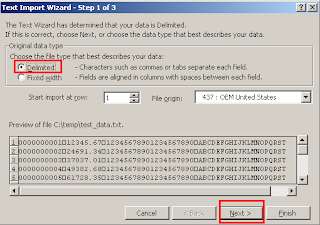 Once we open the file, excel will bring “Text to column” wizard. 5. Select the “Delimilated” option in the first screen. Move to the 3rd Step of the wizard by pressing the Next button two times. 6. In the 3rd step, select all the columns. To select all the columns do like: Click on first column, Hold the shift key, scroll to last column, click on last column. This way all the columns gets selected. The colums which got selected will have black background. Now, select the Option “Text” in the format. This is the code snippet I have used to generate the test file. wa_data-amt   = '12345.67' * sy-index. * our output in the tabular format. This is one of my published blogs on the SAP Community Network. This blog show a way to generate the formatted excel files using the XML. From release 620, ABAP has provided us a way to transform our data using the XML transformation. We can very use the XML to generate the formatted Excel File…. Most of the times, the excel file will be downloaded, converted to tab delimited text file & again uploaded into SAP program by the End user.The end user will not try to do the above steps. If you can post any code for excel macros(office 2007 or older verions) to retain/rest the excel precision limit or any other solution, it would be great. I liked the Marbles game very much.Displaying the ALV output in the same selection screen is also good. Please keep up the good work.